Shooting pictures of people can be fun, and it can also be stressful. One of the easiest avenues for entry into this exciting field is family portraits. 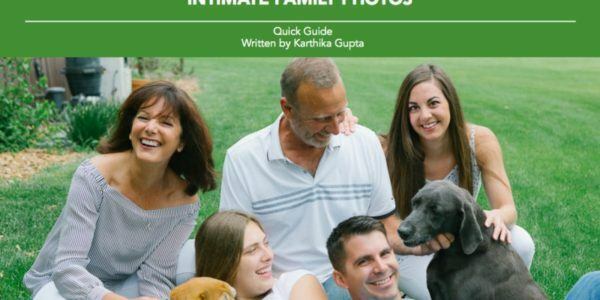 An entire sub-genre of the family portrait industry has developed around what is called “The Candid Family Portrait”, or, in a softer terminology, “Intimate Family Portraits”. This style of family portraiture is designed to ‘not’ look like a portrait, and it has a huge demand. Karthika Gupta, who is a lifestyle, wedding, and family portrait photographer from Chicago, in the United States, has built an entire career out of this sub-genre of portraiture. She has written us a FREE quick guide on her philosophy, techniques, and approach when creating intimate family portraits. You’re sure to enjoy this informative quick read.